What does every holiday have in common? In my house, two things. A cheese board and champagne. Regardless of the season or what’s served for the main course, every celebration starts with a toast to the occasion and a delicious spread of cheese, meats, crackers, and an assortment of goodies from the pantry. To make a tasty platter, you don’t need much. A quick trip around the cheese counter at your local Harris Teeter will ensure happy guests and full bellies. After perusing my Instagram feed, I realized the cheese board can be so much more! Below you’ll find ideas for a Retro, Southern, and Foodie inspired cheese board. Meats and cheeses are the star, so make sure they get plenty of space. Cheeses that need to be sliced should be placed towards the edge. Dips, candied nuts, salsas and warm bread sticks are all welcome additions to a holiday cheese board. Just when you think it looks full, add one more thing! Who doesn’t love fondue? 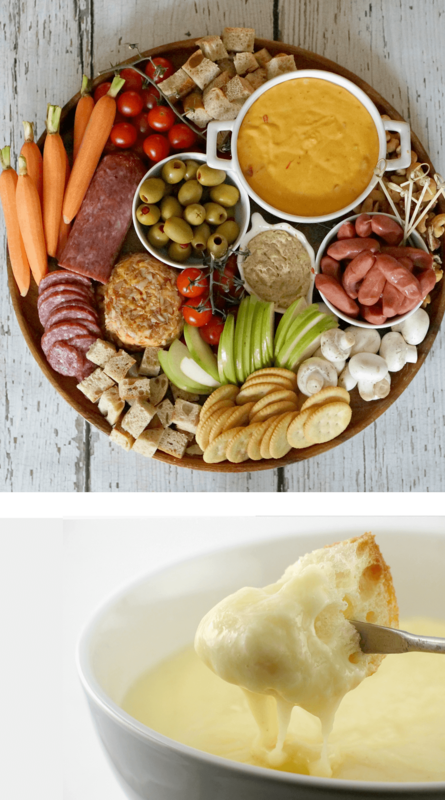 Serve a warm pot of cheese along with salamis, little smokies, a classic cheese ball and fresh veggies for dipping. You won’t hear, “When’s dinner?” for awhile! In fondue pot on medium-heat setting, add garlic clove, juice from one lemon and white wine. Bring to a gentle boil and reduce heat to low. Add cheese by the handfuls, stirring constantly. Meanwhile, stir together the brandy and cornstarch until thoroughly mixed, then add to the cheese mixture and stir until you reach a smooth consistency. Stir in ground pepper and freshly grated nutmeg to taste. Adjust the heat setting to keep the fondue smooth, but not boiling. Smoked meats and cheese. Pickled everything. 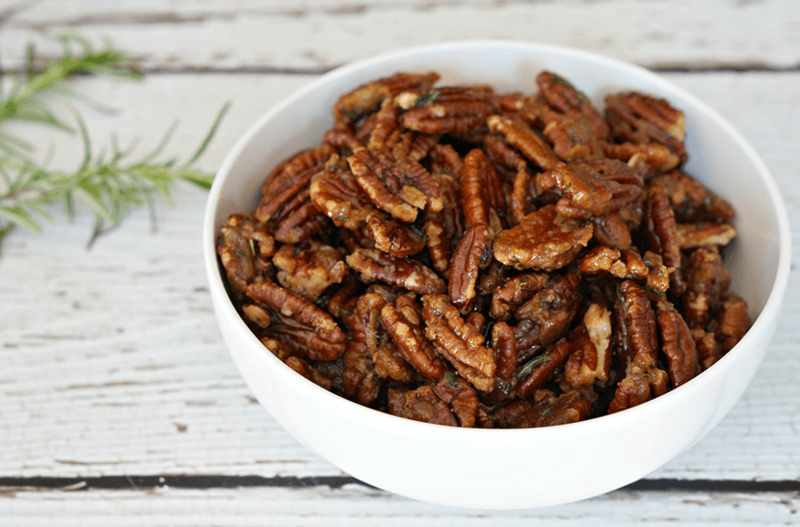 Southern pecans. This is what a traditional Southern holiday charcuterie spread looks like! In a large saucepan, melt butter over medium heat. Add pecans and stir to coat. Add in the brown sugar, rosemary and salt. Continue cooking until caramelized, about 5-6 minutes. Pour mixture out onto parchment paper and allow to cool completely before storing. Perfectly cured Italian meats and cheese flecked with truffles are just the beginning. A variety of specialty chocolates, in-shell nuts, and a selection of fruits will turn anyone in to a self-proclaimed foodie! First, combine 12 ounces of fresh cranberries (so much less expensive than dried! ), ½ cup of water, ½ cup of Chardonnay, ½ cup of sugar, a sprig of fresh rosemary, ½ cup of fresh lemon juice and the zest of a lemon. Bring to a gentle simmer and allow to cook, stirring occasionally until the cranberries burst and the sauce thickens. Remove the rosemary sprig and with an immersion blender, blend until you get the consistency you desire. If you don't have an immersion blender, process in a food processor or blender with the cap removed to allow hot air to escape. Cover the hole loosely with a towel to prevent splatters. Allow the sauce to cool completely, then transfer to a storage container and refrigerate for up to 5 days.